It’s a new year, so I thought I’d start a new series (or several). Each month, I’ll feature a themed collection of my favorite things. Our house always seems messy after the craziness of the holidays and winter. Let’s battle the clutter and mess with a few of my favorite organizational products, tips, and tutorials. Wooden hangers, like the Bumerang set from Ikea can handle the weight of heavy winter coats, and they look nicer than wire hangers. Other than small plastic hangers in the boys’ closet, we have wooden hangers everywhere, scored when Linens-N-Things went out of business. If you got little kids, hanging hooks within reach is helpful. 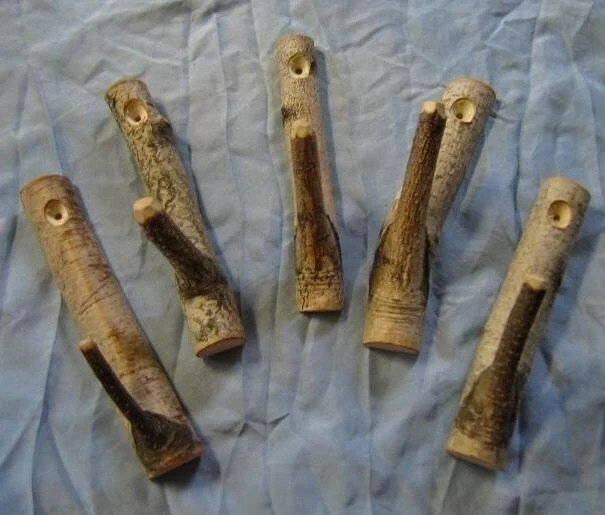 For visible areas, get pretty hooks, like these Birch branch hooks by The Vermont Branch Company. Though inexpensive, the Flyt magazine files from Ikea hold up well. I can say that because I have oodles of them in my office. Try organizing magazines by month, not year, for easier browsing. Kassett boxes from Ikea are so versatile. Store CDs and DVDs, pop on a shelf or in a cabinet and everything is neat and orderly. Bonus, you can make pretty labels. Who doesn’t love making labels?!? 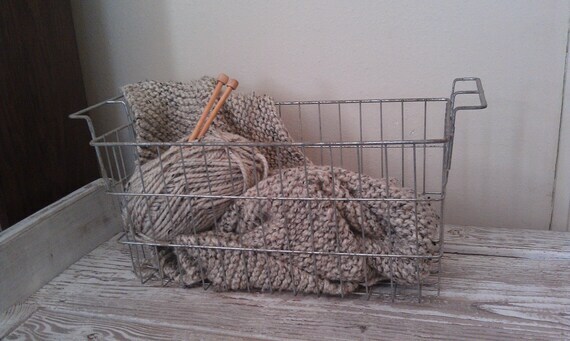 Baskets, whether metal (like this Vintage wire basket from Grasshopper Cafe or this one from Target), woven, or plastic, corral all sorts of things like toys, newspapers, knitting supplies, etc. In the theater room, we have a metal basket to throw throw blankets in. An expandable Bamboo cutlery tray from The Container Store can keep utensils at the ready. We don’t have anything this fancy…yet. Instead, we’ve got a divider similar to this. A few months ago at Ross, I found an OXO pop container for 50% off the regular price. Let me tell you, they’re worth every penny. Why? They’re square, maximizing cabinet/drawer space, you know there’s an air tight seal when you push the button down, and they come in so many sizes. Don’t make your guests search for toiletries. Buy a few apothecary jars from Hobby Lobby or Michael’s, toss soap, cotton balls, cotton swabs, razors, travel shampoo and conditioner inside. It looks pretty and your guests will thank you. Maybe not literally, but they’ll think it. If you hate storing bottles of shampoo and conditioner, we’ve got a solution. Pretty up a cheap soap pump from Wal-Mart with porcelain paint pens. Overstuffed closet? 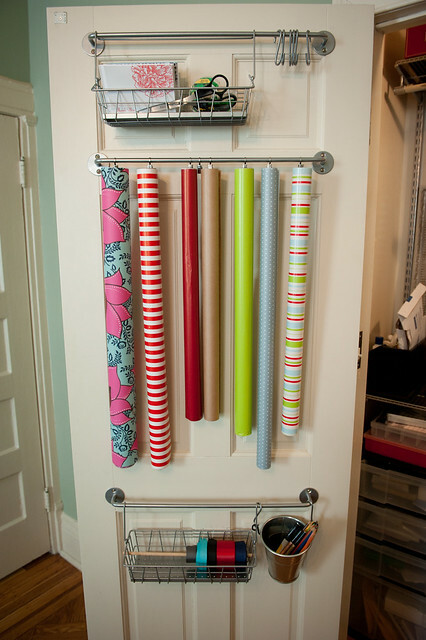 Try adding a second closet rod to double your hanging space. It has worked wonders for our boys’ closet. Don’t let your boots take over your closet. Hang em like Brown Eyed Belle did. Finally fold a fitted sheet. Wrapping paper out of control? Set up a wrapping station at the back of a door like Brooklyn Limestone‘s. 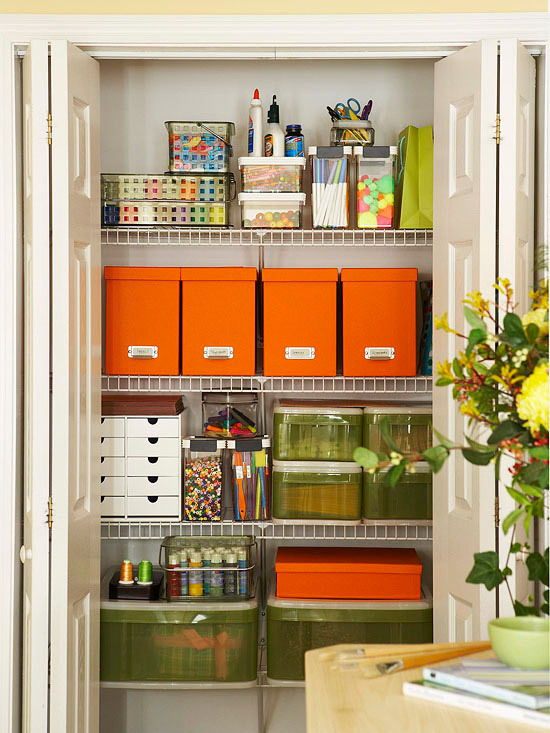 Keep all craft items in the same closet for a one stop shop before starting a project. Try using this small drawer stack, these handled totes, and more Kassett boxes from Ikea for a similar look. 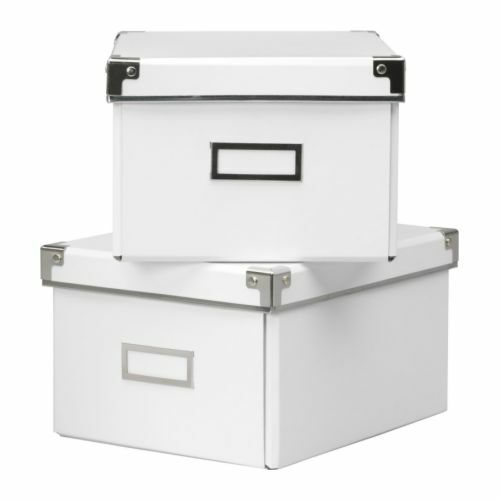 Care to share one (or more) of your favorite organizing items or tricks? Favorite one I shared today? I love the idea for hanging boots, thanks. I currently use the cardboard tube from finished rolls of gift wrap to hold my tall boots up, but this might be even better. I love the hanging boots idea, especially for those taller boots. They don’t fit under the bed. If the calf part isn’t stiff enough, when you stand them in the closet, they just fall over and look like a huge mess. I have to put a lower bar in the closet and do this with my boots and maybe I’ll see if there is a way to do it with flip flops and other types of shoes. Lots of great ideas here! We used Closetmaid shelving from the ReStore for the nursery (we also bought an extra bar, but the baby’s clothes will be so little we won’t need it for a while!) and also put a hanging sweater-shoe-organizer combo from Target in there to corral some of the things he’ll have. I was *just* contemplating hanging a pair of misbehaving boots this weekend – after seeing these pics I’m gonna give it a try! Great ideas! I’ve been on an organizing kick in both my house and my classroom (I’m an art teacher who has a LOT of stuff!!!. I’ve bought drawer organizers in all sizes, jars for smaller items, a hanging shoe organizer for small art supplies, and so many more. I need to work on my daughter’s room – toys everywhere – but we’re about to move her to a big girl room (once it’s completed), so we’ll do stuff then to make sure everything matches well. For now she’s got boxes, bins, and baskets for the majority of her things. You should check out Ross or TJ Maxx for bamboo flatware organizers. They have several options (at least ours in Missoula do!) for much cheaper than Container Store! Love all of these storage options! Love love love the closet idea! We just moved into an old house with a very tiny closet so thanks for the suggestions!